Don’t ever say that contributor LeeMichael McLean doesn’t know how to party. He made his time in Vegas very worthwhile, if not exactly profitable…. The Cosmopolitan is by far the most chic of the Vegas hotels, a building virtually dripping with jewels and art. One of its most visible features is a two-story chandelier with a bar inside! By these visual standards, the buffet did not disappoint. 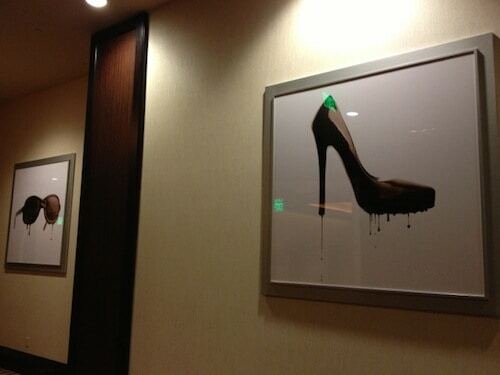 The hallway leading to Wicked Spoon was hung with huge photos of expensive things dipped in chocolate, like sunglasses and stilettos. Though the food was delicious, it wasn’t quite as inventive as the décor. In addition to the selections standard to each buffet I visited (salad bar, charcuterie, sushi, Asian cuisine, meat carving station, pasta and fish dishes), the Wicked Spoon got bonus points for including a macaroni and cheese station, with tons of protein and veggie options as well as a selection of cheeses that they would melt together to your exacting specifications. 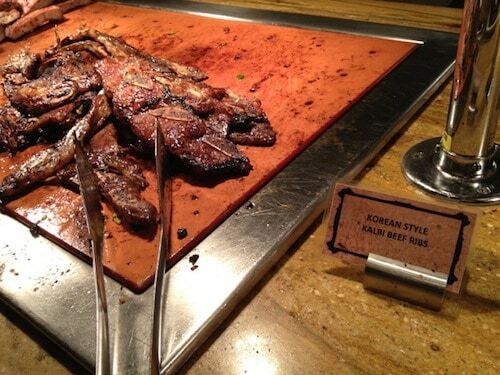 At first I thought I would just go crazy and try every single thing on the buffet, but then I tasted the Korean-style kalbi beef ribs and knew I had to have seconds! I went on to have thirds. The flavor was just sweet enough with a perfectly succulent tang; their texture was right on and didn’t toughen up under the heat lamps above. The leg of lamb, sadly, was a different story; my piece was dried out and overdone. Passing by later, I saw a new piece of lamb being carved that was a wonderful pale pink and oozing with jus. I should have waited! The desserts were merely okay—a letdown given the chocolate-dipped décor that enticed me—but surprisingly the mango sorbet was worth writing about. It was as smooth and as rich as the best of ice creams. Whoever decorated The Buffet at Wynn decided to limit themselves to the color palette of supermarket sherbets (with a particular focus on lime green), but once I started eating, I forgot all about the décor. Wynn served up a spectacular red snapper in coconut curry and his fish cake on sweet potato biscuit with Creole aioli was terrifically unique. The sweet potato biscuit—perhaps a distant cousin to a warm oatmeal raisin cookie, minus the raisins—made a perfectly soft sandwich for the delicate fish cake and slaw, and the sweet, salty, fishy, and tart flavor profile was complex and exciting. I noticed the Wynn buffet seemed to put out smaller portions of food and replenished more quickly than the Cosmopolitan, which may have helped to keep the food temperature, moisture, and texture just right. 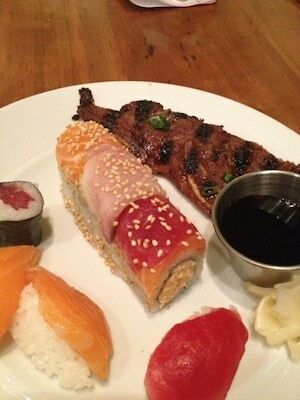 The sushi selection, while melt-in-your-mouth good, was a little skimpy compared to the Cosmopolitan. This may have been a lunch vs. dinner issue, but they offered the usual rolls and salmon on rice and all passed muster with this sushi snob. Then came dessert…. All of the buffets had wonderful-looking standards like chocolate chip cookies, cream-filled pastries, cakes both molten and otherwise, sorbet, gelato, and fruit, but the Wynn also had candy apples! Who serves candy apples on a buffet? Steve Wynn does. Displayed among delicate madeleine cookies, the color and crunch contrast was adorable and delectable. Everything was so delicious I wanted to go back for dinner. This is what a feast looks like. The shellfish was mounded so high they could barely fit another piece under the sneeze guard. The carving station looked like an entire farmyard of animals. The buffet went on forever and was by far the largest of the three; I could not hope to sample even 25 percent of the dishes. As opposed to the limited options of the Wynn with fewer portions sitting around, Caesar puts it all out there, and I think the quality suffers a bit for it. The sushi selection was enormous and over the top: they didn’t just have salmon rolls, they had something like a dragon roll with salmon, tuna, and something else piled on top of a roll. I say “something else” because it seems like not $1 of Caesar’s much-trumpeted $17 million renovation went to replacing the illegible food signage. With at least five different types of seafood on display in even more configurations, the entire area was simply labeled “sushi.” While unlabeled, the sushi selection blew me away. 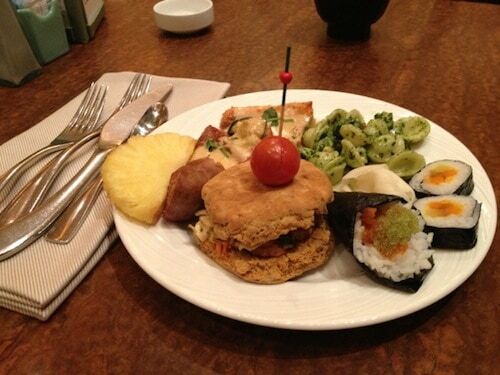 It was leaps and bounds ahead of the other two buffets and was hard to move on, but I tore myself away. It seemed like almost everything else I ate (save the sushi) had a downside: the shellfish section dazzled the eyes, but every option from oysters to shrimp to mussels was disappointingly tasteless. The Chinese roasted duck had a wonderful flavor, but there was barely any meat on the bone. The sweet potato tater tots, served in an adorable baby frying basket, were overburdened with an intensely sweet and sticky sauce. 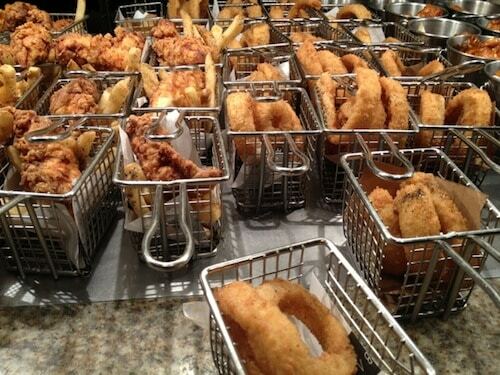 The onion rings, on the other hand, were excellent—but I don’t think anyone comes for the onion rings. The desserts were a delight, however: cherry bread pudding, Oreo mousse domes, chocolate chip molten cookie ramekins, many, many mochi flavors, French macarons, chocolate buttercream cone pops, and (cue the angel chorus) a crepe station! I couldn’t get enough of the delicate rounds with fresh berries, sautéed bananas, and nostalgic toppings (Nutella, caramel, powdered sugar, etc.) 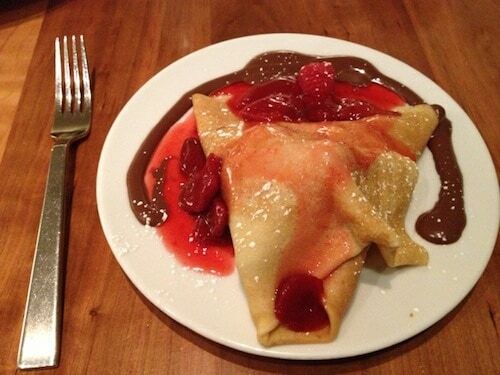 I ordered my first one and the guy walking up next to me exclaimed “They have crepes! ?” That was my reaction too. I wish I had started and ended at the dessert station! 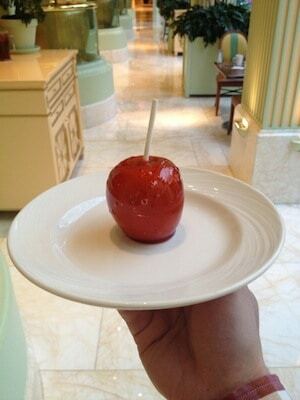 By a candy apple, The Buffet at Wynn! The Cosmopolitan was a close second. I think the key comes down to portion control under the heat lamps and focusing on making a limited selection the best it can be. Maybe Caesar will iron out his kinks, but I find it hard to believe it will ever be worth paying all the additional money for more options that don’t deliver on flavor. It was a feast for the eyes, and presentation is important, but you don’t pay to just look at the food. I had no idea what to do about this, so I Googled my way to manners: apparently 10 percent is acceptable for getting drinks and clearing plates… and there were a lot of plates to clear!